Whether you’re a cosplayer, a die-hard fan of the hugely popular manga/anime Naruto TV series or simply upping your game in time for Halloween, Sharingan Contact Lenses will help take your costume to a whole new level of awesomeness. Typically hard to come by, our extensive range of cheap Sharingan Lenses enable you to get the ultimate look without breaking the bank. Whether you’re replicating Naruto’s look for Comic-Con or teaming up with your mates for a Naruto, Itachi and Kakashi trio, we’ve got the lenses that’ll take your look from ‘good’ to ‘great’. Boasting millions of fans across the globe, the animated Naruto series tells the compelling tale of fictional shinobi, Naruto Uzumaki, his quest for recognition from his peers and his dream of becoming the Hokage (leader of the village) in Konohagakure. Eye of Insight – Encompasses superhuman clarity of perception, enabling the wielder to read lips, it also allows them to see Chakra and flawlessly copy an opponents Ninjutsu, Genjutsu and Taijutsu techniques from sight alone. Eye of Hypnotism – Enables the wielder to influence an individual’s thoughts and actions through eye contact, and in extreme cases, take complete control of an individual's body without their knowledge. It also enables the wielder to appear as though they ‘see the future’. Despite our best efforts, our Sharingan contact lenses don’t posses theses powers. However, with vibrant colors and skilfully replicated designs, they bare a striking resemblance to the Sharingans wielded by Naruto characters. Kakashi - Replicating some of the most iconic Naruto styled eyes, our Kakashi contact lenses are a strong favorite among cosplayers. Featuring a near identical replica of the level-three matured Sharingan, they’re a great final detail for anyone looking to replicate the Naruto character’s look, whether it be just for fun, a convention or Halloween. 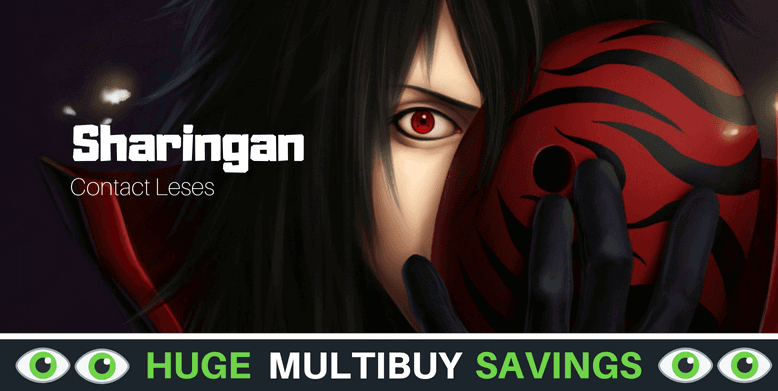 Madara - Madara mangekyou Sharingan Lenses replicate the immensely powerful eyes of Madara. In the animated series his mastery over them surpassed every other member of the Uchiha clan, making him a popular choice among cosplayers. Susuke - Replicating Sasuke Uchiha’s Sharingan eyes, our Sasuke lenses look sensational. In the animated series, they give Uchiha the ability to detect small muscle tensions in an opponents body and subsequently predict their next move, but only when ‘fully activated’. Regardless of design, when you buy Sharingan Lenses, you can rest easy knowing they are manufactured from high quality materials and packed in sterile conditions at our state of the art, UK-based factory. Also FDA approved, they boast a lifespan of up to 12 months, long enough to see you through the entire annual Cosplay Convention calender as well as Halloween.